The Nintendo 3DS is a great place to hang out if you like rhythm games. 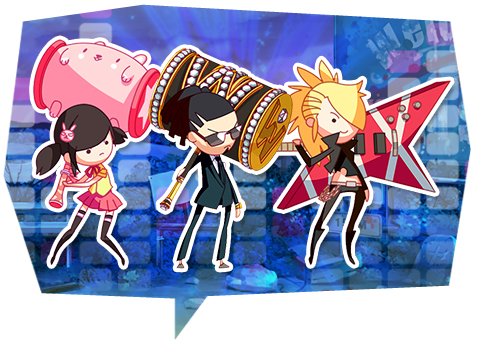 Rhythm Thief sneaked into the handheld in 2012, Final Fantasy Theatrhythm and its sequel crystallized the genre's staying power, and HarmoKnight hit all the right notes. The newest rhythmically-inclined title to land on the Nintendo 3DS via the eShop is Radiohammer. 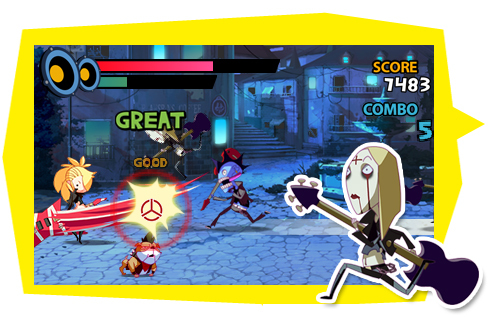 Radiohammer got its start as an iOS and Android game, but Arc System Works and the game's South Korea-based developer Vinyl Lab co-developed a 3DS port that is now available in the States thanks to Aksys Games. Eager to play a new rhythm game, I tuned my 3DS to this game's frequency and jammed to its music. While the game let me down in a few areas, I was generally impressed by its sense of style, memorable boss encounters, and replay value. In Radiohammer you play as a group of DJs that fend off goofy threats with giant hammers. Well, one of the characters uses a guitar, but she's the rebellious one in the group. The DJ you play as will remain stationary on the left side of the screen while enemies run at you from the right in patterns that are timed with songs. It's your job to smack these foes away with the proper timing. The controls are easy to grasp. Simply press X to swing upward and B to swing downward. The D-Pad and touchscreen can also be used for the same actions, but I preferred to the X and Y buttons. 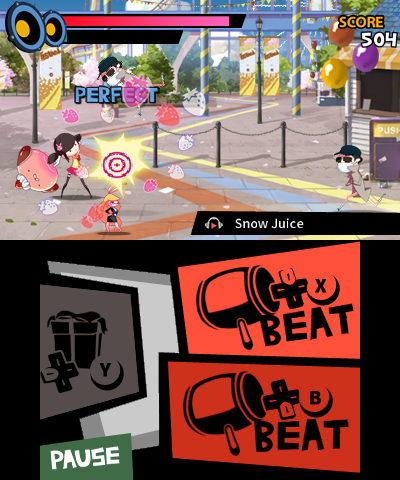 In addition to enemies, presents occasionally appear near the DJ that can be grabbed with the D-pad or Y button. Presents contain some kind of power-up, but there are also green presents mixed in that can hurt your DJ. Grabbing these items is optional, but it's a satisfying wrinkle that is tuned to the music just like the enemies. Hit some enemies, grab a present, hit another wave of foes, lay off the green present, and hit a few more bad guys to end the stage. That's generally what you'll be doing in Radiohammer, and it's a fun routine for the most part. The story mode is broken up into chapters. Chapters revolve around a specific DJ and their manager as they make their way through a nonsensical story. You'll play through a bunch of missions and take on a boss to wrap up each chapter. It's a solid foundation, but the missions themselves are hit and miss. After playing through a few missions you'll start to hear the same songs and fend off similar enemy patterns. I felt like I was going in circles too often and too soon, so repetition sunk in pretty quick. Thankfully the gameplay is solid, so I still had some fun playing through these repeating tracks. The songs themselves range from catchy to forgettable, but all of them suit the gameplay well enough. These songs are incredibly short, so early missions can be cleared in no time. Later missions include multiple songs, making them more of a challenge. Once all of a DJ's missions are cleared, you'll be ready to take on that chapter's boss. I think these battles are the highlight of Radiohammer, and for a couple of reasons. First of all, the soundtrack is at its best during these boss battles. The songs are much longer than the ones used for regular missions, and they're usually more complex, too. The other thing that I like about these levels is their absurdity. The bosses are a sight to behold, and some of their dialogue is pretty funny. A couple of them even clash with the game's art style in an appealing way. It really feels good to beat these guys. Especially with a three-star rating. In addition to the story mode, there is also a "Track Play" mode that allows you to play any song individually, a "Random Play" mode that challenges you to a gauntlet of shuffled songs, and a jukebox if you simply want to listen to any of the songs. Apparently there's a mode called "Otherworld Mode" that significantly revs up the difficulty, but unless I'm missing something I don't think I've unlocked it yet. Oh, and you can change the style of gameplay by selecting "another mode" before starting a level. In this mode, there will only be one line of enemies, but they're a little harder to hit. You need to listen for certain cues to anticipate them. Overall, Radiohammer is a good-looking game. Menus are clean and stylized, and the DJs stand out in a good way with their ridiculously giant weapons and cartoon-y features. The stage backgrounds have some animation, but they're pretty basic. What's unfortunate is that this is a 3DS game with no 3D to speak of. There are a bunch of games on the eShop that look fantastic in 3D, and I'm bummed that this isn't one of them. I think these graphics would have looked great with the 3D slider cranked all the way up, and I feel that the gameplay would have been better for it, too. It's occasionally hard to read which line an enemy is coming from because there isn't much visual depth to help separate those lines. It also doesn't help that the visuals are somewhat blurry, but perhaps this is a side effect of playing on an XL-sized 3DS system. Anyway, I think 3D would have helped bring some definition to the visuals and really made the presentation pop. All in all, Radiohammer is an affordable, simplistic rhythm game on the eShop that I'd recommend to fans of the genre. The 3DS has better options for these kinds of games, but Radiohammer has its own merits that help it stand out in the crowd. I hope good rhythm games continue to arrive on the 3DS, because I'll keep playing them. Did you play the Rhythm Heaven games at all? Specifically the Wii one? Did you endeavor the Final Fantasy game? Is this a genre you generally enjoy? How about Rock Band / Guitar Hero? I sure did! I even own Rhythm Tengoku on the Game Boy Advance. Rhythm Heaven Fever is probably my favorite game in the series, but I love all of them. 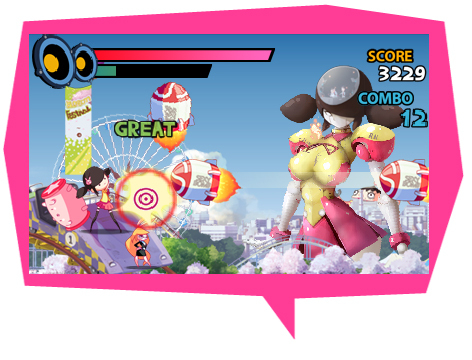 Another Rhythm Heaven game came out this year in Japan for the 3DS, so hopefully it'll be localized. I've played the Theatrhythm games, too. They're great. There's even a Dragon Quest Theatrhythm in Japan! Get on that localization, Square-Enix! I've played one of the Guitar Hero games a few times when my brother bought it. The gameplay just didn't grab me on those occasions. I've never played a Rock Band game, though. So yeah! This is a genre that I have a lot of fun playing. What about you? Do you like these kinds of games? Good review! It convinced me to add this game to my wanted list, so I'll check it out at some point in the future. Rock Band and Guitar Hero are pretty interchangeable. I was kinda asking about them as a whole; seems you just like rhythm stuff with your fingers on a screen as opposed to fake guitars, and thats alright. I really liked Rhythm Heaven Fever (the Wii one, yes? ), but it got so FRUSTRATING sometimes when you did an action or movement or whatever, and it didn't register properly. I guess thats the fault of Wii remote though, yes? I had similar frustrations with the special song parts in Zack & Wiki. The thing I like most about Guitar Hero / Rock Band in that regard is that you can physically press down your button to prepare for the upcoming onslaught of notes, and you can SEE (on screen) which fret you have readied so theres no mistaking it. By the way, one of the bosses in Radiohammer is shredding on what looks like one of Guitar Hero's controllers! It's pretty funny. I don't remember having that problem with Rhythm Heaven Fever. The simplistic controls are very intuitive. That said, it took some practice to get the hang of some levels (like Monkey Watch) because of their intricate rhythms. I had similar struggles with Zack and Wiki, though. Those rhythm mini-games were cool even though they could be a little frustrating. It's one of my favorite games on the Wii despite having some difficulty with the motion controls at times. Yeah. I actually think that the Guitar Hero game I played had good controls, but the controller itself felt unwieldy in my hands. I think I didn't play the game often enough to get the hang of it. The lack of 3D kind of bums me out. Even though I had no idea that this game existed. I'll keep it mind after I work though my 3DS rhythm backlog. True story! During Black Friday, I noticed that the Collector's Edition of Theatrhythm: Curtain Call was on sale at the Squeenix website, so I picked it up. When I was putting it into my 3DS stash today, I noticed that it came, alphabetically, right next to... the Collector's Edition of Theatrhythm: Curtain Call. Yep, I rebought the same damned game. So I now have two unopened Collector's Edition copies. I guess that makes me a collector! Yeah. I usually play 3DS games with the 3D slider all the way up if the game allows it. It just feels like a missed opportunity here. That's an amazing goof. Restrain yourself if you see the game on sale again! Its weird starting out with Guitar Hero, and how difficult it feels. And like a week later, you're flying all up and down the neck no problem. I play on "Regular," but I'm struggling to score enough points, so I'll have to jump to "Advanced" soon. Now that, I'm worried about. Guitar Hero becomes less "fun" and more "hard" at that point. Guitar Hero is supposed to be fun. Restrain yourself if you see the game on sale again! Hmm... how good of a sale are we talkin', here?